Community Sourced Capital’s model of crowdsourcing modest-sized, interest-free loans to local businesses is set to spread across Washington under a partnership with the state Department of Commerce. When Karl Mueller and Aaron Barthel, co-owners of Seattle’s Intrigue Chocolate, went looking for a loan to help fund their move to a new retail space in Pioneer Square, they grew frustrated with a local bank’s attempt to steer them into higher-interest credit cards or lines of credit instead. So they turned to Community Sourced Capital (CSC), a Seattle company whose online-crowdfunding platform enabled them to raise more than $40,000 in an interest-free loan, much of it coming from local people as well as family members and friends. It’s a philosophy and platform that the state Department of Commerce hopes can fuel the growth of small businesses in more rural and underserved parts of Washington, as the two organizations launch a program this week to expand CSC’s reach. CSC, which made its first loan in 2013, is among a group of crowdfunding companies, including Kickstarter, Indiegogo, GoFundMe and Kiva, providing online platforms for people or organizations to run campaigns to raise money for their projects. Some, like Kickstarter, focus on donations, with perks or rewards along the way. Others, such as Kiva, raise money for loans to individuals and small businesses targeting global poverty. CSC’s specific focus is raising funds from community members who want to support local small businesses by providing money for interest-free loans. Here’s how CSC works: Businesses that are approved for the platform run a four-week campaign, typically for projects ranging from $5,000 to $50,000. People who want to support the business go onto CSC’s website and buy “Squares.” Each square represents a $50 zero-interest loan to the business. If the campaign is successfully funded, the business owners start paying back the “Squareholders” soon afterward, and have up to three years to repay the full amount, though there are no guarantees. So far, 98 percent of CSC’s loans have been repaid in full or are in good standing. Crowdfunding is a rapidly growing market, which globally more than doubled to raise $16.2 billion in 2014, according to Massolution, a crowdfunding and crowdsourcing research firm. Massolution predicts that number will jump to $34.4 billion this year. “We’re in a great period of experimentation for crowdfunding, from pure commercial to philanthropy,” said Ethan Mollick, an assistant professor of management at the University of Pennsylvania’s Wharton School. The idea for CSC came from four classmates who were getting MBAs at Pinchot University, formerly called Bainbridge Graduate Institute, which emphasizes social justice and sustainability. It was 2011, and influenced by the Great Recession, they wanted to build a business that could help create healthy local economies. CSC doesn’t make money from the zero-interest loans. Rather, the company charges businesses $250 to launch a campaign on its platform, and $50 a month after a campaign is successfully funded, until the loan is paid off. The company also offers sponsorships for its programs. CSC declined to disclose its financials or the private investors who back it. About 90 percent of the businesses that have launched campaigns on CSC have succeeded in raising the targeted amount, something Maxwell attributes to CSC’s vetting of companies’ financial situations and their community connections. So far, CSC has loaned about $838,000 to 50 businesses, most in the Seattle area. They include Il Corvo Pasta, whose owners used the money to open Pizzeria Gabbiano in Pioneer Square; and A&R Solar, a renewable-energy company that used its CSC loan to outfit its new office space in Sodo. 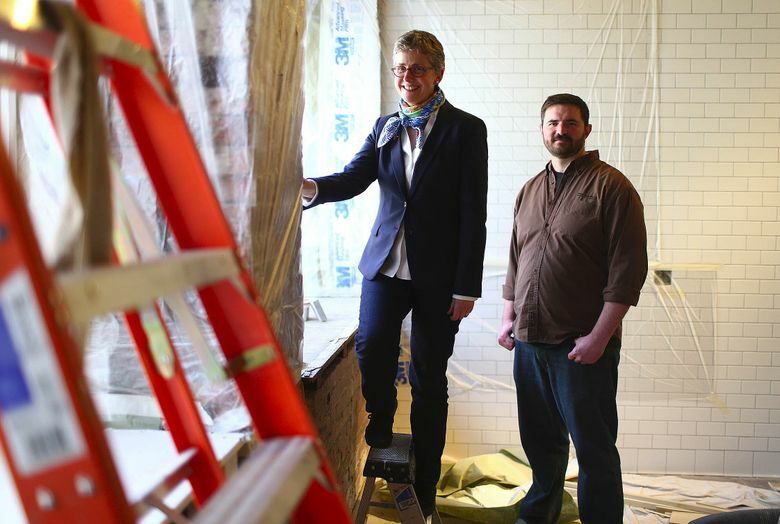 Chocolate-confection maker Intrigue Chocolate, which is outgrowing the small, hard-to-find space in its current Pioneer Square location, started its CSC campaign in March to help lease a site that is easier to find and has space for a tasting bar and more retail. CSC hopes to replicate that kind of success as it launches the Fund Local program this week, in partnership with the state Department of Commerce. The program, designed to address the lack of access to capital for small businesses, especially in rural and underserved areas, has a goal of running a CSC campaign for at least one company from each of Washington’s 39 counties. Getting capital is tough for any small business, with many banks reluctant to fund loans under $50,000, given the amount of due diligence required. In rural areas, it’s even tougher, since many locally owned community banks have been swallowed up by larger banks or have simply disappeared. Locally owned banks are more likely to lend to small-business owners, since often they know the owner’s reputation and trustworthiness, said Charles Tolbert, a sociology professor at Baylor University who studies financial institutions in rural areas. Now, with those institutions gone, small, rural businesses find it harder to compete for loans from big, faraway banks. “When we sit around a table with owners of small businesses in rural areas, they laugh when you mention ‘What about bank funding?’ ” Tolbert said. That’s the hole the state hopes the Fund Local program will help fill. “Small businesses create jobs in communities all across our state, yet they often struggle to access capital when they’re ready to grow and expand,” Gov. Jay Inslee said in a statement launching the program. The department’s network of economic-development organizations in each county is getting the word out to local businesses. In Spokane, one company that’s already launched a campaign is LINC Foods, which connects small local farms to large buyers such as grocery stores, colleges and restaurants. LINC Foods is trying to raise $5,000, just the first phase and a small portion of the $600,000 it will need to create a craft grain-malting operation. The main reason it’s running a CSC campaign, said Beth Robinette, co-founder of LINC Foods, is to get more community support behind the project. “It’s an opportunity to have our customers have a stake in the success of our company,” she said.